Asian Canadian Writers' Workshop (ACWW): Faye Leung's new book "The Hat Lady Sings! 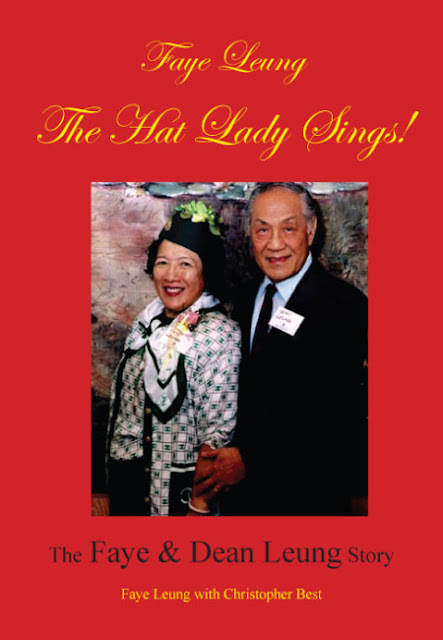 The Faye & Dean Chun Kwong Leung Story"
Faye Leung's new book "The Hat Lady Sings! The Faye & Dean Chun Kwong Leung Story"
Faye Leung is a third-generation born Canadian Chinese who was raised in the Chinatowns of Victoria and Vancouver. As a cultural pioneer, Faye’s life bridged the best of the Chinese and Caucasian worlds and her life’s work enhanced and enriched both worlds for future generations. Faye and Dean her husband never charged any money for their public or private service, as they considered it an honour to freely give of themselves. Faye’s lifetime achievements have been groundbreaking for women and ethnic minorities yet they have gone largely unnoticed. Faye fought for decades since her youth against discrimination and restrictions for equality for Asians. She helped local Asians and immigrants find their rightful place in business, community and society thus improving their livelihoods. The Chinese bestowed upon her the title of Ambassador-at-Large for the Chinese. Her decades in business bridged and pioneered the economic and social gaps and hosted, assisted, cultivated and fostered an understanding between Canada, Taiwan, Hong Kong and the Far East resulting in billions of dollars of investment for all Canadians to reap the benefits. Faye & Dean were role models and mentors who were respectfully appreciated for their sacrifices that made it possible for Chinese to live a better and good life in Canada where once they were severely restricted and discriminated against. They were the first Chinese businessman and the first Chinese businesswoman who made it all possible especially Faye as back then women were never allowed. Faye never thought of herself as a woman nor felt restricted as a woman in all of her business dealings she just carried on and got the job done. These are two proud Canadian leaders who have helped give Chinese the freedom, privileges and prestige which generations of Chinese-Canadians enjoy today.